A tactile experience like no other! Tactile and visual stimulation sure to calm and soothe. They're pretty darn difficult to put down. Translucent "beads," glitter and colored gel inside. Incredibly squishable and cool to the touch. A tactile experience like no other! 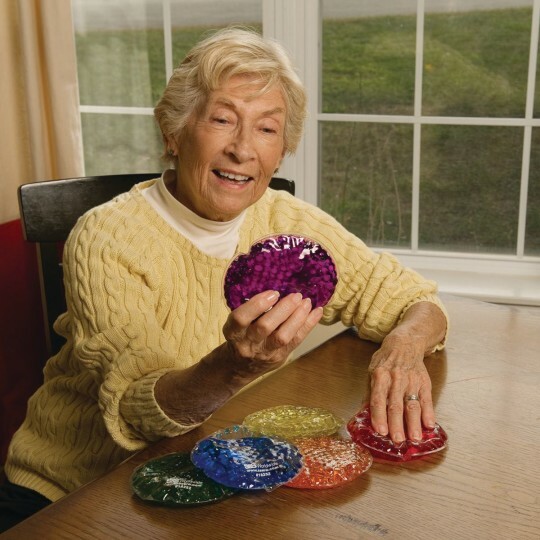 The sensory qualities of these discs provide tactile and visual stimulation sure to calm and soothe ... they're pretty darn difficult to put down! 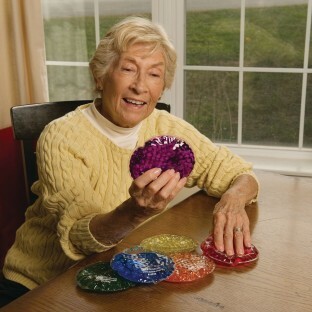 The translucent "beads," glitter and colored gel inside make each disc incredibly squishable and cool to the touch. Perfect for sore or arthritic hands! Set of 6 discs in six colors. 5" diameter. Do not freeze. We use these sensory pads with autistic children and they are very soothing and so easy to use.